In a large pitcher or punch bowl, combine the wine, blood orange juice, ZICO coconut water, lime juice, pomegranate seeds, blood orange and lime rounds. Stir to combine. Chill the sangria mixture until ready to serve. Stir in ice cubes, if needed. 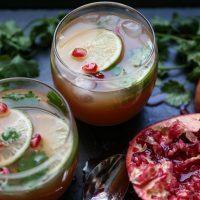 Ladle the blood orange sangria into glasses and garnish with fresh cilantro and pomegranate seeds.